New Delhi: Up to four mega food parks will become operational during the course of next three months, Union Minister of State for Food Processing Industries, Sadhvi Niranjan Jyoti said at an ASSOCHAM event held in New Delhi. 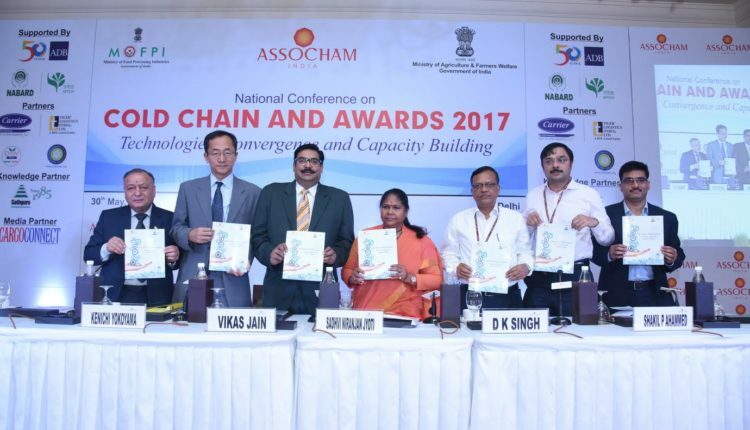 “Only two mega food parks became operational between 2009 and 2014 whereas six mega food parks became operational between 2014 and 2017 likewise 42 mega food parks will become operational by 2019,” said Sadhvi Jyoti while inaugurating an ASSOCHAM National Conference on Cold Chain. She said that while the government is working at a rapid pace for development of food processing sector, the industry should impart training to the farmer to take utmost care of quality of produce. She said that she was surprised to note that there was not even a single food park in such a huge state which is equivalent to a country’s size. Knowledge partners for the event Sathguru Management Consultants (P) Ltd. released a report on ‘Cold Chain’. Dr Satyanarayana KV, Lead – Food Processing & Retail Practice said that “Technologies addressing the holistic needs of the local supply chains need to be adopted. 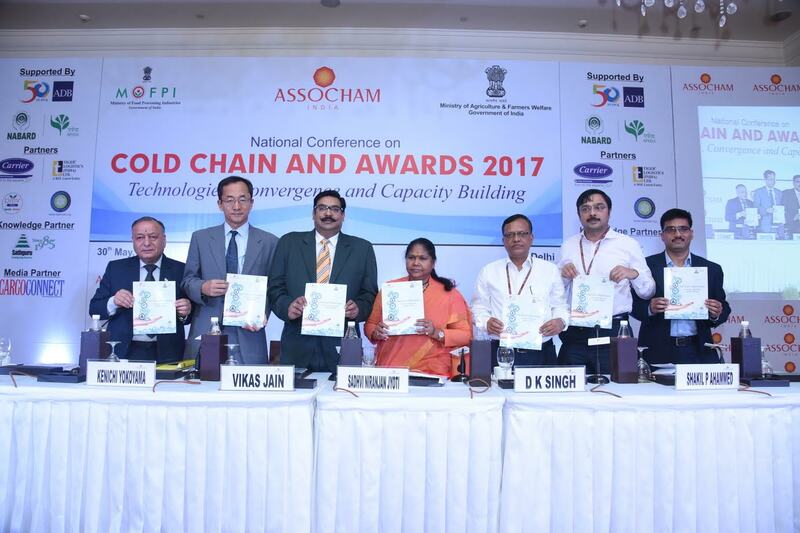 An ecosystem for nurturing R&D, technology transfer and subsequent commercialization of novel cold chain technologies should be created. Skill development is the need of the hour considering the rapid expansion foreseen in the sector”. Earlier, while addressing the ASSOCHAM conference, Mr D K Singh, chairman, APEDA (Agricultural and Processed Food Products Export Development Authority) said that his organisation is working on horticulture sector to increase export basket. He informed that APEDA is trying to export and promote mangoes in a big way. “When we think of a business plan in logistics development we must also think those aspects which are relevant in a particular market,” said Mr Singh highlighting that feedback received from Korea on export of mangoes was not good, in terms of quality, packaging and other related issues. “We realised that we focus only on the backward integration in the system but we never thought what is the co-relation and forward linkages up to the country where it is reaching,” he added. He rued the fact that logistics for cold chain for import items is better than for the export items as those products have to be brought and quickly distributed to the consumers. “That segment is well off and the industry is ready for a distribution network but not for exports and industry is not ready to work with farmers,” said the APEDA chief. He added that merely creating few cold storage for potato, apple, grapes would not be sufficient in order to increase farmers’ income, as such a system needs to be put in place to collect the farmers’ produce at the farm, sort it, grade it in next 5-6 hours and then transport to a place having pre-cooling facility and from there to the pack house for higher level of packaging and processing and then from that point it is taken to the port for export. “So the entire chain has to be addressed and preferably by a chain of operators who have interest in the entire value chain,” said Mr Singh. “We are working on a scheme for next three years where we have made for the first time significant role for service provider in a big way and our proposal is that EFC stays and once our approval of EFC comes the scheme will be implemented and we will seek suitable and viable proposals from service providers who are ready to work with the farmers and for exports,” further said the APEDA chairman. World IP Day event in Hyderabad organized by APTDC and CII.